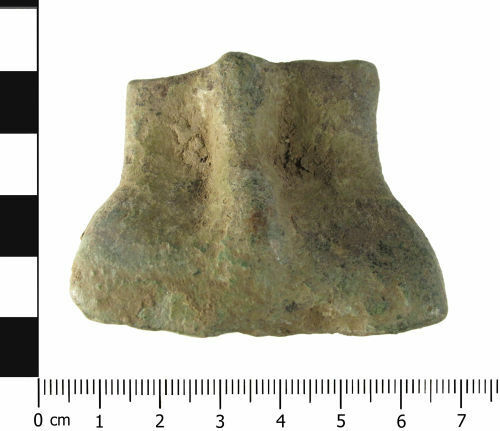 A Medieval or Post Medieval (12th to mid 19th century) cooking vessel leg: In plan the copper alloy leg is a sub-trapezoid on the outer face and base of the foot and in profile it is a curved rectangle. The upper edge of the leg is broken but it is not recent as the patina covers the break. The base of the foot is sub-trapezoidal with the narrowest edge forming the reverse edge. The leg and foot is decorated, on the outer face, with a prominent, integral vertical ridge which is sub semi-circular in section. The surface of the leg has a mottled green coloured patina. The leg measures 48.08mm wide across the foot, and 30.52mm tall. It weighs 138.8g. It is uncertain what type of vessel this leg comes from, but Egan (1998) comments that commonly used cooking vessels in the Medieval period include skillets, ewers, and cauldrons. According to Butler, Green and Payne (2009), "From about AD 1100, cast copper alloy vessels...were commonly used for downhearth cooking, with the vessel sitting among the embers or suspended over the fire. All but the poorest medieval or post-medieval households would have had at least one metal cooking vessel....These vessels gradually passed out of use between 1700 and 1850, superseded by cast iron pots...".